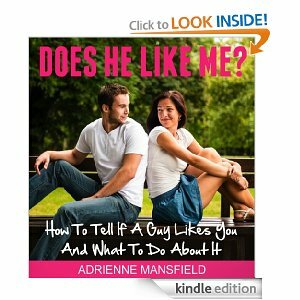 So you want to know if a guy likes you? Some guys can be hard to read if they don’t just come right out and tell you they like you. The good news is that a guy’s body language can be a big giveaway when it comes to figuring out if he likes you. There are certain things guys do subconsciously when they like a woman. If you know what signs to look for, you can decode his body language and find out if he’s crushing on you. Here is a list of 24 signs a guy likes you. If a guy did only one of these things, it probably wouldn’t tell you much. But if he does a bunch of them, then you can be pretty sure he likes you. Click here to take our quiz to find out if your crush likes you back. If you notice a guy smiling at you, it’s a pretty good indication he likes you. It’s natural to smile at someone you like, but how do you know if it means something more? Try to notice how often he smiles at you. If he seems to smile at you a lot more than would seem normal, he probably likes you. If he seems to smile at you whenever you lock eyes, for no apparent reason, he probably likes you. If a guy makes eye contact with you and it feels prolonged, even just a fraction of a second longer than would seem normal, he is most likely interested in you. Especially if he flashes you a big grin at the same time. Have you ever caught a guy staring at you, and he suddenly turns away? If you catch him once, it could be a mere coincidence. But if it happens more than once, chances are he likes you. Provided you aren’t doing or wearing something absurd or have food on your face, he’s probably into you. If a guy is always walking near you, sitting next to you, or just seems to pop up wherever you are, those are all good signs that he is interested and trying to find opportunities to get closer to you. If you feel as though a guy is invading your personal space just slightly, this could be a major sign that he likes you. Take note of the distance between you when he’s around. If he’s a little bit closer than he should be, he probably likes you. If you move in a little and he doesn’t step back, it means he’s receptive. If he responds by getting even closer, you can be pretty certain he really likes you. If a guy leans in facing you with his shoulders square to you, and rarely turns his back, that kind of body language is a good indication he’s interested in you. When a guy likes you, he may subconsciously stand up taller, push his chest out, and tuck his stomach in to impress you and appear more masculine. If a guy is slouching and suddenly stands up taller when he sees you, this could indicate he’s subconsciously trying to impress you. People tend to subconsciously mirror each other’s actions when they are listening to one another intently. If a guy mimics your body language, this could be strong indication of his interest because it means he’s focused on you. Try leaning forward, touching your hair, taking a sip of your drink, or resting your chin on your hand. If a guy likes you, he might start copying your gestures without even realizing he’s doing it. If you notice a guy making a lot of unnecessary physical contact with you, he probably likes you. He might brush against your arm, pat you on the back, put his hands on your shoulders, touch his leg to yours, or give you a lot of hugs. The more physical contact he makes, the more obvious it is that he likes you. If a guy raises his eyebrows in response to something you say or do, it could be an indication of his interest in you. On its own, this might not be enough to tell if a guy likes you, as it could just be a friendly, non-flirty facial expression, so watch out for other signs too. If a guy starts grooming himself when he sees you, he may be subconsciously trying to look good around you. If he starts fixing his hair, brushing the lint off his clothes, or straightening his tie, it could mean that he likes you. If a guy acts nervous, blushes, gets flustered, or is just awkward around you, he probably likes you. He’s most likely nervous about making a good impression. If he laughs at your jokes, even when they aren’t that funny, it’s a good sign he likes you. If a guy tends to show off a lot around you, he probably likes you and is just trying to get your attention. Let’s say a guy tells a joke or does something funny in a group and everyone around starts laughing. If he looks at you first to see your reaction, it’s a sign he likes you because he wants to make sure you noticed and laughed too. If a guy’s behavior changes the minute he sees you, that could be a sign he likes you and is trying to impress you. If he’s in a group and he’s laughing or acting rowdy, he might instantly quiet down when he notices you. Or he might have been quiet and then suddenly gets louder and tries to become the center of attention to impress you. Watch how a guy acts around his friends or other girls. If he treats you differently, that could be a sign he likes you. If a guy likes you, he may start to act protective of you. He might give you his jacket if you’re cold. Or if you are walking through a crowded place, he might position himself in front of you to push away the crowd. If you’re around a guy when he’s hanging out with his friends, and they know he likes you, they may tease him subtly. Watch how his friends act around you. If they turn towards him, smile at him, punch him in the arm, or smirk knowingly, they’re probably messing with him because they know he likes you. If a guy is keeping an eye on you and looks jealous or annoyed when you’re talking to another guy, he probably likes you. He might try to look like he’s not paying attention, but he’ll keep tabs on you to see if you’re interested in the other guy. He might even sigh or walk away. If a guy’s watching you while he’s flirting with another girl, he’s probably trying to get your attention and gauge your reaction to find out if you like him. Why else would he be looking at you when he’s supposed to be flirting with someone else if he didn’t like you? When you’ve been talking to a guy, and he’s about to leave, but then stays one second longer than he had to, it’s a sign he likes you. That one second longer was a moment of hesitation where he was trying to decide if he should ask for your number or ask you out. If a guy makes eye contact with you just before leaving the room, even though he’s busy talking to someone else, he probably likes you and wanted to get one last look at you. He was probably hoping you were looking at him too so he could lock eyes with you one more time. Hes showing 14 out of the 24 signs here but he has a girlfriend and a 6 month old baby what do I do? I have this guy that who is my bestfriend. Lately , i noticed that the he does more skinship and more eyecontact with me . I would think he likes me , but he always mock my height and laugh at everything embarassing i did. Does he just like to tease me , or does he likes me ? I don’t know if he likes me or we are just friends. Wth but you see this guy in my class constantly stares at me and I don’t know why but I always lock stares with him when he does and we just do wacky faces. And also when he does something crazy he looks at my way.. I don’t know if it’s a sign that he likes me or something. And most of the time he talks to me and we laugh and I just can’t stop smiling when he does that. Is it a sign that he likes me or I’m just making conclusions that he does…. I used to like this guy in my class but stopped liking him when i felt like I was invisible around him. After telling my best friend that I was dating a guy, my (old) crush overheard and started giving all these mixed signals from standing right behind me while lining up to acting weird and smiles whenever he sees me. Is he jealous or something or is this normal? So I like this boy and it’s the start of school but he’s the new kid and I know a lot of girls that always talk about him and I hear them saying stuff like “he’s cute ” and stuff like that. Anyway I always catch him staring and he’s flirty around my bff and I think he knows that we’re friends cause he’s always around me and I’m always talking to her I don’t know if he likes her or not or of he’s trying to make me jealous cause he looked at me strait after he was talking to my bff I think he’s trying to see what I do about it and he’s talking to other girls soooo much and I’m like the only girl he doesn’t talk to he only compliments me every now and then it’s weird and MAH FRIEND ASHLEY SHIPS ME AND HIM AND WHENEVER HE’S AROUND SHE GOES “HEY, *his name* come here! Emily wants to say somethin’ to ya” I’m soooo glad he doesn’t hear otherwise I would start up die anyway I don’t know if he likes me or not and my bff is starting to fall for him it’s annoying and she doesn’t shut up about him I hope my friend Mark can tell me if the guy I like likes me cause Mark is best friends with him…. My crush has smiled a few times. And stared. And has come into my class a few times even though he has friends in other classes, but some of his friends are in my class. We don’t take any classes together. But he rarely smile, and hangs out with the popular boys but he is very quiet and “shy”. I held the door for him this morning and he said “Thanks” (or he said Thank You) he was quiet. And he hurried towards the door. And his voice went higher then normal. He has a low voice. I replied “no problem”. And later that day several classes had presentations. So 3 classes (his included) went to one presentation room. And he kept looking my way. But does he really like me? On some days he “ignores” me. Like he doesn’t even look at me even if I am right infront of him. Pls help! Thanks! Yep! If he ignores you, stares, is too harsh, too nice, or denies, he is definitely into you. Aggressive crushes deny. Confident crushes admit. Shy crushes are too quiet. My crush is shy but aggressive. He denies or ignores me but his friends say otherwise… Thx! Saying ‘Thank You’ won’t lead to any conclusion (Some people are kind towards everyone ). But if he looks for you and maintains an eye contact you can be sure enough to say that he likes you. he looks into my eyes when we are close, he burst out shouting phrases that only i would understand, he nudge my feet with his when im lying down, he act differntly around me, he touch me when we are surrounded by friends/family but never when we are alone. we sometime jokingly fight, he talks with a slight smile with his friends everytime. help pls i dont know whether hes into me or just being friendly. i do agree with all of these signs, but it doesn’t necessarally mean that the guy likes you, it could me that he is just maybe wants to be your friend. I have a guy friend that does all of these things but does not really like me, he like this other girl… how you know when he likes a girl is usually when he starts acting a little strange and runs away every time that you get near him, also the guy would be very jumpy… at least that is what my guy friend does when he is around the girl that he likes. p.s. people think we are dating but we aren’t, the girl he likes is like in love with him (they are dating) and she gets really jealous when he is around me sometimes, idk why, and why would i like a friends boyfriend, not cool. So there was this guy that I’ve had a huge crush on for a while and later on found out he liked me a lot too. He would do almost every single thing on the list above about body language. Everyone knew we both were crazy about each other, but I found out he was still hanging out with his ex and he still seemed interested in her. The way he looked at her was similar to the way he looked at me but he claimed to be over her? He always got nervous around me and only me and I always left him speechless. What does that mean? Probably, if he only looks at you. If he also looks at everyone else too then no. Yes,of course maybe he is nervous to talk to you,or shy to you because he likes you. Probably not. Mostly, men or boys like to talk to the girls they like. I know that because I am a guy. Im on this website because Im looking for what to avoid. 50/50 chances that he likes you. im also in that situation,he smiles at me while leaning and when i look at him hes smiling at me prolonged and then turn away..what does it mean? ?he never had a chance to talk to me but hes always around.. He is probably too shy. Give it some time and see. same is with me ….